Peace - Watch It Happen "Live" !!! . . . . . . . 4/22/2019 4:24:00 AM Anna in United Kingdom just scored another Yellow Tag click from United States. [New Score: 5058 points] . . . . . . . 4/22/2019 3:53:54 AM John in United States just scored another Twitter click [New Score: 30230 points] . . . . . . . 4/22/2019 3:53:19 AM Dustin in United States just scored another Twitter click from United States. [New Score: 26053 points] . . . . . . . 4/22/2019 2:59:13 AM Peter in France just scored another Yellow Tag click [New Score: 18422 points] . . . . . . . 4/22/2019 2:59:12 AM Joyce in United States just scored another Yellow Tag click [New Score: 1202 points] . . . . . . . 4/22/2019 2:59:12 AM Aline in UK just scored another Yellow Tag click [New Score: 3316 points] . . . . . . . 4/22/2019 2:59:11 AM Alexis in Canada just scored another Yellow Tag click [New Score: 5116 points] . . . . . . . 4/22/2019 2:59:10 AM Aline in UK just scored another Yellow Tag click [New Score: 3316 points] . . . . . . . 4/22/2019 2:59:09 AM Alexis in Canada just scored another Yellow Tag click [New Score: 5116 points] . . . . . . . 4/22/2019 2:59:09 AM Aline in UK just scored another Yellow Tag click [New Score: 3316 points] . . . . . . . 4/22/2019 2:59:08 AM Alexis in Canada just scored another Yellow Tag click [New Score: 5116 points] . . . . . . . 4/21/2019 10:41:08 PM Simona in New Zealand just scored another Yellow Tag click from Germany. [New Score: 157 points] . . . . . . . 4/21/2019 10:37:10 PM Simona in New Zealand just scored another Yellow Tag click from Germany. [New Score: 157 points] . . . . . . . 4/21/2019 8:35:08 PM John in United States just scored another Twitter click from United States. [New Score: 30230 points] . . . . . . . 4/21/2019 8:27:51 PM John in United States just scored another Twitter click from United Kingdom. [New Score: 30230 points] . . . . . . . 4/21/2019 7:48:09 PM John in United States just scored another Twitter click [New Score: 30230 points] . . . . . . . 4/21/2019 7:45:57 PM John in United States just scored another Twitter click from United States. [New Score: 30230 points] . . . . . . . 4/21/2019 7:45:31 PM John in United States just scored another Twitter click from United Kingdom. [New Score: 30230 points] . . . . . . . 4/21/2019 7:45:19 PM John in United States just scored another Twitter click from United States. [New Score: 30230 points] . . . . . . . 4/21/2019 7:45:18 PM John in United States just scored another Twitter click from Canada. [New Score: 30230 points] . . . . . . . 4/21/2019 7:45:17 PM John in United States just scored another Twitter click from United States. [New Score: 30230 points] . . . . . . . 4/21/2019 7:45:17 PM John in United States just scored another Twitter click from United States. [New Score: 30230 points] . . . . . . . 4/21/2019 7:45:15 PM John in United States just scored another Twitter click from United States. [New Score: 30230 points] . . . . . . . 4/21/2019 7:45:11 PM John in United States just scored another Twitter click from United States. [New Score: 30230 points] . . . . . . . 4/21/2019 7:45:00 PM John in United States just scored another Twitter click from United States. [New Score: 30230 points] . . . . . . . 4/21/2019 4:39:09 PM frank in Australia just scored another Yellow Tag click from United States. [New Score: 813 points] . . . . . . . 4/21/2019 1:51:10 PM Denise in United Kingdom just scored another Twitter click [New Score: 1302 points] . . . . . . . 4/21/2019 11:20:18 AM Joyce in United States just scored another Yellow Tag click from China. [New Score: 1202 points] . . . . . . . 4/21/2019 11:17:49 AM Nira in United Kingdom just scored another Yellow Tag click from China. [New Score: 3181 points] . . . . . . . 4/21/2019 10:52:17 AM Tamara in United States just scored another Twitter click from United States. [New Score: 6488 points] . . . . . . . 4/21/2019 8:21:25 AM Karen in United States just scored another Yellow Tag click from United States. [New Score: 1421 points] . . . . . . . 4/21/2019 5:27:01 AM Gina in United States just scored another Yellow Tag click from United States. [New Score: 108466 points] . . . . . . . 4/21/2019 4:49:50 AM Dustin in United States just scored another Twitter click from United States. [New Score: 26053 points] . . . . . . . 4/21/2019 4:34:03 AM Denise in United Kingdom just scored another Twitter click from United Kingdom. [New Score: 1302 points] . . . . . . . 4/21/2019 4:07:46 AM John in United States just scored another Twitter click [New Score: 30230 points] . . . . . . . 4/21/2019 3:20:08 AM Anna in United Kingdom just scored another Yellow Tag click [New Score: 5058 points] . . . . . . . 4/21/2019 2:25:30 AM Denise in United Kingdom just scored another Twitter click from Netherlands. [New Score: 1302 points] . . . . . . . 4/21/2019 2:19:36 AM Denise in United Kingdom just scored another Twitter click from United States. [New Score: 1302 points] . . . . . . . 4/21/2019 2:19:01 AM Denise in United Kingdom just scored another Twitter click [New Score: 1302 points] . . . . . . . 4/21/2019 2:18:52 AM Denise in United Kingdom just scored another Twitter click from United States. [New Score: 1302 points] . . . . . . . 4/21/2019 2:18:52 AM Denise in United Kingdom just scored another Twitter click from Ukraine. [New Score: 1302 points] . . . . . . . 4/21/2019 2:18:51 AM Denise in United Kingdom just scored another Twitter click from United States. [New Score: 1302 points] . . . . . . . 4/21/2019 2:18:51 AM Denise in United Kingdom just scored another Twitter click from Canada. [New Score: 1302 points] . . . . . . . 4/21/2019 2:18:50 AM Denise in United Kingdom just scored another Twitter click [New Score: 1302 points] . . . . . . . 4/21/2019 2:18:50 AM Denise in United Kingdom just scored another Twitter click [New Score: 1302 points] . . . . . . . 4/21/2019 2:18:50 AM Denise in United Kingdom just scored another Twitter click from United States. [New Score: 1302 points] . . . . . . . 4/21/2019 2:18:50 AM Denise in United Kingdom just scored another Twitter click [New Score: 1302 points] . . . . . . . 4/21/2019 2:18:49 AM Denise in United Kingdom just scored another Twitter click from United States. [New Score: 1302 points] . . . . . . . 4/21/2019 2:18:48 AM Denise in United Kingdom just scored another Twitter click [New Score: 1302 points] . . . . . . . 4/21/2019 2:18:48 AM Denise in United Kingdom just scored another Twitter click from United States. [New Score: 1302 points] . . . . . . .
My Peace Impact Meter to the left shows you how I am creating peace in many different categories that are tracked in real-time -- just click the icons around the globe. In green you can see how much good I am doing personally. In red you can see how much good all the people "downstream" from me are doing. It shows all the people they have positively influenced, and all the people those people went on to influence, an infinite number of levels deep! In blue you can see the positive peace impact of the average member of 10 Million Clicks For Peace. I WANT PEACE and I want to bring the troops home. If you think the time for violence to stop is long overdue, then join me and 10 million other visionaries who are changing the world. With every simple action I take--mostly with just a few clicks of my mouse--I'm sheltering and feeding war refugees all over the world. Whether it's adding a signature file to my outgoing regular email (like the link you clicked to get here), or, spreading peace by handing out those amazing "Pass Along Peace Cards", I am making a great difference in the world that I can see right register immediately on this Peace Impact Meter! I'll soon be responsible for raising thousands of dollars and I'm proud to be saving lives of the innocent bystanders of war! Yes, I'd like to save lives and stop the wars. Cost of the War in Iraq...Alone! If the cost to care for one war refugee for a day is $5, then all the world's war refugees (over 19 million) from all the world's wars could be sheltered and fed for 12 years just from this war. Of course, lack of peace is very expensive in many other ways. The trauma of millions of violent crimes including domestic violence, as well as the physical injuries sustained, are other measures. I'm building a more peaceful world! See How I'm Creating a Worldwide Chain-Reaction of Peace! Imagine inviting your 5 best friends to get their own Peace Impact Meter. Then they invite only 5 friends (and believe me they'll tell more than 5). Those 25 tell only 5 and those 125 people connect 625 people who tell just 5. That's 3,125 people you've connected. Each and every one of those thousands will register on YOUR Peace Impact Meter! You'll be responsible for setting off a chain reaction of peace and saving lives of those who just happened to be in the wrong place at the wrong time! Ready to start your own chain-reaction? There are 1 billion people connected to the internet, and most of them don't want any part of violence and war. For the first time in history we can all vote for peace by banding together to make a more peaceful world. You don't have to stop what you're doing, or drive somewhere to participate. Heck, you don't even have to march! 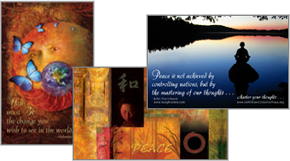 Just get your own Peace Impact Meter and express your desire for a more peaceful and harmonious world in every email you send. 10 Million Visionaries can't be wrong! Join the Virtual Peace March. Pass Along Peace Cards are a unique and fun way to spread peace out into the real world AND ramp up your Peace Impact Meter. You can 'track' where every card goes as well as view the messages recipients leave. The best part is that every pack of cards helps shelter and feed refugees and promote peace education! When you receive your cards simply give the cards away to family and friends, leave them with your tip at a restaurant, on the ATM machine when you get money, give them to a grocery clerk or person who serves you and share them with co-workers. The list of possibilities is endless. One side of the card contains an inspirational message of peace, while the other side contains instructions for how to track the card through our special website. What an exciting way to pass along peace! Get your meter to find out more. FREE Posters of Peace are a beautiful way to remind yourself of your personal mission to become more peaceful AND to help spread peace out into the world. The retail value of each professionally designed, full-color 11" x 14" poster is $12.95 but it's yours FREE. You're only responsible for shipping and handling. The best part is that every free poster helps shelter and feed war refugees! A super gift idea for those you care about! What a beautiful way to inspire others to become more peaceful! Email I Send and You Can Too! That's right . . . every email I send can help spread peace and ramp up my Peace Impact Meter. All I do is set up my email program to use a signature (sig) file at the bottom of my emails. When people see it (like you just did), they are naturally curious to see how I'm spreading peace and they click the picture or link. When they do, they arrive at this page and they start spreading peace too. A special code is embedded in the links, so when the recipient of your email clicks, it registers in this category on your Peace Impact Meter. Email Your Way to World Peace! One of the best parts of this project is that I'm getting a continuing personal growth and success course by mail. It builds on the founders' vision that world peace is the natural and automatic result of all peoples becoming more personally peaceful. The Peace Rewards™ program shares how to create a more successful, happier, and more peaceful life with a collection of products sent up to once-a-month by mail. This program helps me achieve success and happiness, while I'm helping refugees and contributing to world peace! I want the Peace Rewards™ Program! This "Little Yellow Tag" is changing thousands of lives by inspiring the Internet community to create the conditions required for world peace. One tag on a website or blog can move hundreds of people towards more peaceful, happier, healthier and successful lives. It's just a matter of time before you see these tags everywhere. Ever saved a life before? By emailing my friends with websites and blogs, I'm helping heal the lives of many war refugees. The installation takes only 5 minutes, and you can see right on your meter all the good those tagged sites and blogs are doing. Yes, I'll be a tagger for peace! I'm using the awesome networking power of Twitter to make a huge impact in the world. It sync's up with the peace-building software I use that is so successful it caused the grandson of the great Mahatma Gandhi to write, it will "...lighten the burden of peacemakers everywhere." I can create, see, and measure the impact I'm having on a major world problem, while allowing me to inspire thousands of people to help. I am now in charge of world peace! Join me in using the most powerful social networking mechanism with the most powerful peace-making software in the world! Join me in Tweeting for Peace! Copyright 2007 by 10 Million Clicks for Peace. All Rights Reserved. Design by LightWerx Media. Project facilitated by The Messenger Network.